Fig. 1: Single shot layered reflectance separation using proposed two-way polarized light field (TPLF) camera. (a) Components of the TPLF camera in disassembly. (b) A raw photograph taken by the TPLF camera under uniform (hemi-spherical) illumination (circular microlens pixels visible in zoomed-in view). (c, d) Standard polarization preserving (specular + single scatter) and depolarized (diffuse) reflectance components separated with light field sampling. (e, f) Specular-only and single scattering further separated from the polarization preserving component (c). (g, h) Shallow and deep scattering components further separated from diffuse component (d). 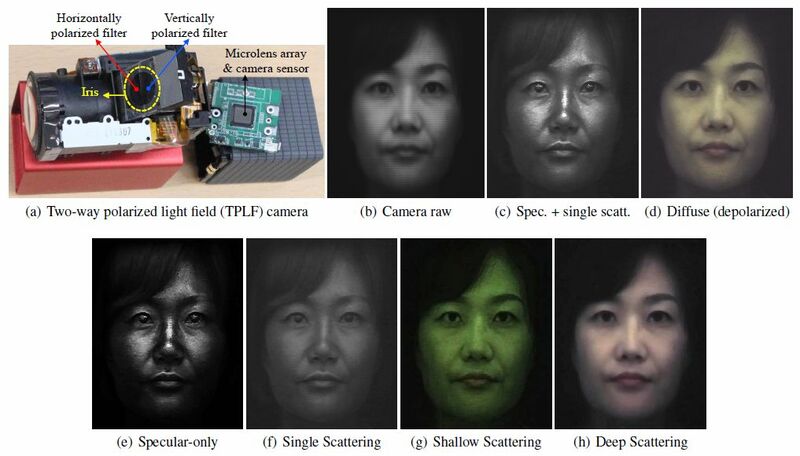 Note (e) through (h) present results of layered reflectance separation comparable to the multi-shot technique of Ghosh et al. .
Abstract: We present a novel computational photography technique for single shot separation of diffuse/specular reflectance as well as novel angular domain separation of layered reflectance. Our solution consists of a two-way polarized light field (TPLF) camera which simultaneously captures two orthogonal states of polarization. A single photograph of a subject acquired with the TPLF camera under polarized illumination then enables standard separation of diffuse (depolarizing) and polarization preserving specular reflectance using light field sampling. We further demonstrate that the acquired data also enables novel angular separation of layered reflectance including separation of specular reflectance and single scattering in the polarization preserving component, and separation of shallow scattering from deep scattering in the depolarizing component. We apply our approach for efficient acquisition of facial reflectance including diffuse and specular normal maps, and novel separation of photometric normals into layered reflectance normals for layered facial renderings. We demonstrate our proposed single shot layered reflectance separation to be comparable to an existing multi-shot technique that relies on structured lighting while achieving separation results under a variety of illumination conditions. Publication: Single-shot layered reflectance separation using a polarized light field camera. Jaewon Kim, Shahram Izadi, Abhijeet Ghosh. Proc. of Euorgraphics Symposium on Rendering (EGSR – EI&I), June 2016.